JD Gates Automation and Electrical is a trusted and reliable service provider with over a decade worth of experience. We offer a variety of security and automation services for residential and commercial properties mainly around Gauteng, JD Gates also offers some services in Bloemfontein and Cape Town. 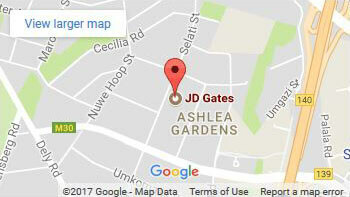 JD Gates takes pride in delivering the best quality services to our clients. With quick turnaround times and competitive prices, you can count on JD Gates for friendly and professional services. Our business mainly focuses on automation and security services like gate and garage door automation, but at JD Gates we don’t limit ourselves as we are focused on many other specialties like professional painting and custom designed gates. Our team of experts can also assist where repairs or upgrades are needed, whether it be a gate, gare door or a motor that needs a battery to be replaced. When it comes to quality, we believe in using only the best and most trusted brands on the market. Centurion, Gemini, Nemtek, and Plascon are some of the products we make use of to name but a few. All of our newly installed products are also under guarantee for a period of time. JD Gates also sells products to the public at competitive prices along with some specials, These products can be found at our store that is based in Pretoria Gauteng. Our friendly staff will also be able to assist you in getting the right product for your needs.